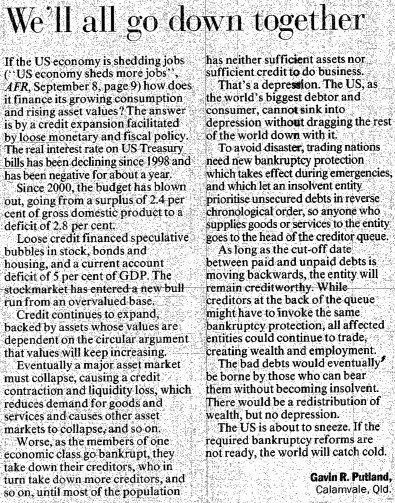 If the U.S. economy is shedding jobs (AFR, September 8, p.9) how does it finance its growing consumption and rising asset values? By a credit expansion facilitated by loose monetary and fiscal policy. The real interest rate on U.S. treasury bills has been trending downward since 1998 and has been negative for about a year. Since 2000, the budget has blown out from a surplus of 2.4 percent of GDP to a deficit of 2.8 percent. Loose credit financed speculative bubbles in stock, bonds and residential property, and a current account deficit of 5 percent of GDP. The stock market has entered a new bull run from an overvalued base. Credit continues to expand, backed by assets whose values are totally dependent on the circular argument that values will keep increasing. Eventually a major asset market must collapse, causing a credit contraction and liquidity loss, which reduces demand for goods and services and causes other asset markets to collapse, and so on. Worse, as the members of one economic class go bankrupt, they take down their creditors, who in turn take down more creditors, and so on, until most of the population has neither sufficient assets nor sufficient credit to do business. That's a depression. And the U.S., as the world's biggest debtor and consumer, cannot sink into depression without dragging the rest of the world down with it. To avoid disaster, every trading nation needs a new form of bankruptcy protection which can be enabled in times of emergency, and which allows an insolvent entity to prioritize unsecured debts in reverse chronological order, so that anyone who supplies goods or services to that entity goes to the head of the queue of creditors. As long as the cutoff date between paid and unpaid debts is moving backwards, the entity will remain credit-worthy. While creditors at the back of the queue might have to invoke the same bankruptcy protection, all affected entities could continue to trade, creating wealth and employment. The bad debts would eventually be borne by those who can bear them without becoming insolvent. There would be a redistribution of wealth, but no depression. America is about to sneeze. If the required bankruptcy reforms are not ready, the world will catch cold.